Many people forget that there are a wide number of different catering options available, one of those options being hog roast catering. 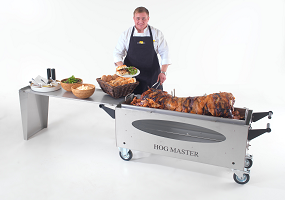 A Taste the Cracklin hog roast is the perfect catering for any event, not only does it taste delicious but it is fantastic to watch a hog being roasted in one of our specialist hog roast machines. It is not every day that you see a hog roast and so our chefs are always happy to answer any questions that guests and hosts may have. If you want a hog roast Swandlincote is home to our expert Taste the Cracklin team who will be able to provide you with one of the best hog roasts you have ever tasted. Our hog roast is a fantastic option for any occasion! A hog roast is a fantastic catering option for any event, it’s great for an informal party where you can have a buffet allowing people to help themselves. It is also a fantastic option for corporate events and weddings where a formal meal may be required. It doesn’t matter what event you are hosting if you want a hog roast in Swandlincote then Taste the Cracklin can provide you with the very best service. To find out more, browse the website or give us a call to talk to one of the team about how we can help you and find out a little more about you requirements. Alternatively, fill in your details on the website and we’ll come back to you with further information.